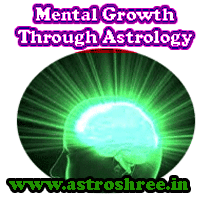 What To Do For Mental Growth As Per Astrology? What To Do For Mental Growth As Per Astrology, how to increase mental capabilities through astrology, Astrologer for analysis of diseases, What to do for memory power, How to enhance memory, Easy ways to increase mental power, Free Encyclopaedia. Mental weakness is one of the common problem which arise with the increase of age but some have this problems from birth and some suffers from mental problems due to harassment, frustration, lack of boosting environment etc. Mental problems include short term memory loss, fear in doing any work, habit of forgetting, getting tempered easily, not able to perform any work with full concentration, insomnia, state of illusion etc. People having weak brain power are generally dominated in the society. They don't get proper response in family. They don't get proper respect in society. They also don't get proper job and also don't get promotion at right time. This type of people suffers from inferiority complex and sometimes enter in depression zone too. Life become burden for this type of persons. So it is necessary to take proper steps to over come from this type of problems. There are astrology remedies, natural ways, yoga which if persons uses daily then within some month good results will come. So there is no need to worry about if there is a weak brain or mind. If any one has any weakness but have the courage and zeal to learn and develop powers then no one can stop him or her to become a successful person. As we all know that in astrology planetary positions are studied to predict any thing so here also the birth chart is analysed to know the astrology reasons of mind problems. The Ist house represent the mind and therefore first of all this house is studied. If it is affected by any malefic planets, if it is seen by any malefic planets, if there is any bad yoga forming in Ist house of horoscope then definitely the person will face some kind of mental problems. For example suppose if debilitated moon is present in the Ist house and with this if rahu is also present then no doubt person will face a very major mental problem in life. similarly if angarak yoga is forming in Ist house in that case also the person will face some typical mind problems in life. So treatment of any problem is necessary. If you are taking medicines then it is good but it is also recommended to take advise from a good astrologer so that you can get the better results soon. Astrologer can advise you to wear a particular gems stone which will increase mind power. Astrologer can tell you the way to worship to attract the divine energies. Astrologer can tell you the special ways to increase memory. Consult one of the best astrologer for any type of mental weaknesses. Proper analysis and solutions will be provided by Astroshree astrologer.